Not your average garage vise grip pliers, these Simms Guide fly fishing pliers made in the U.S.A. feature large ergonomic handles and textured grip. The pliers come with a Kydex holster and utility leash. 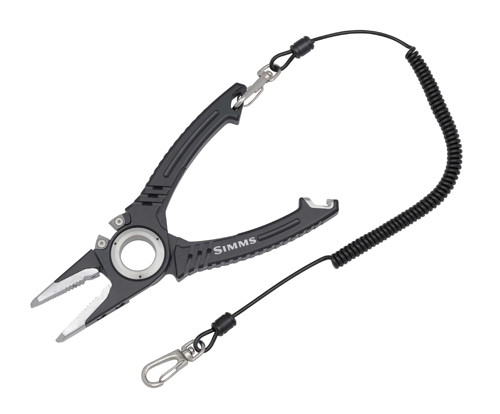 Prime pinchers with ample in-hand ergonomics, Simms’ 7-inch-long Made in USA Plier puts the squeeze on the competition with an advanced design crafted from 6061-T6 Type II anodized aluminum arms. Additional features include a beveled notch bottle opener for tightening knots, corrosion resistant stainless steel jaws and tungsten carbide cutters, and a Kydex holster with utility leash that comes standard. DIMENSIONS: 7" x 2.25" x 3/8"